This exquisite ivory wedding cake is covered in sugar paste icing and hand decorated with delicate sugar flowers and intricate royal iced beading. Hand decorated with ivory ribbon. 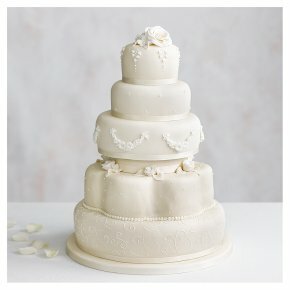 This stunning five tier cake is available in three options.Remove ribbon before serving. Filling Choice: Consists of 2 bottom tiers of a rich dark fruit cake covered in marzipan and 3 top tiers of golden sponge cake with raspberry jam and vanilla buttercream.